Comments: Charles Wingfield and his son, Joseph, lived on the Dr. Percy Harris farm about 3 miles west of Scottsville on Rt. 6. Charlie was in charge of the farming operations. 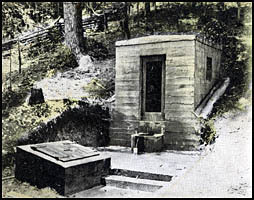 Every Saturday the Wingfields took large water jugs to Albevanna Springs (see 1910 photo of springs at right) and filled them with drinking water for Dr. Percy Harris. This spring water was believed to have medicinal benefits and better for Dr. Harris' gout than Scottsville's water. Ranny Moulton, grandson of Dr. Harris, recalls playing with Joseph Wingfield as well as hunting and fishing with Charlie. After Dr. Harris died, Charlie and Joseph both left the farm. Charlie remarried after the death of his first wife, Alice, and lived near Jefferson Mills. 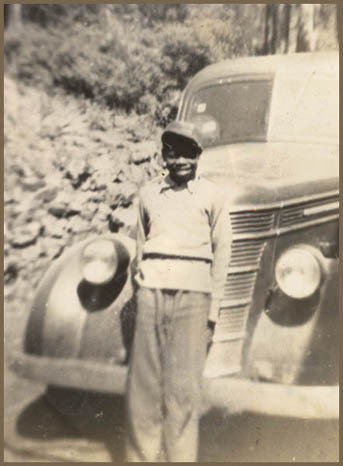 Joseph moved to Philadelphia where he developed a kidney disease and died as a young man. The photos of Charlie and Joseph Wingfield are part of the Ranny Moulton collection. 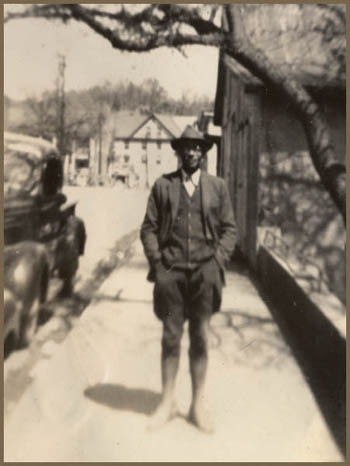 Ranny resides in Macon, Georgia, and is the grandson of Dr. Percy Harris and the son of John Adkins Moulton and Innes Roberta (Harris) Moulton. The photo of Albevanna Springs is a postcard in the Jack Hamner collection. Jack resides in Scottsville and is an avid collector of old Scottsville postcards.